Lora's Crazystamper Blog: It's Ugly Sweater Time!! I have been working away on 3 cards 2 of which you will see today, the 3rd will come in a couple of days. On today's post one image is coloured with Copic & the other with Tombow. The image is Ugly Sweater from Art Impression. This 2nd image is coloured with Tombow. 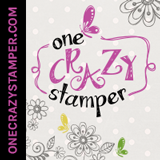 When I use Tombow markers I always emboss my stamped image it really helps with the bleeding of the marker. I will have a 3rd design done with Prisma in a few days. Thanks for stopping by and I hope you find inspiration in today's post.